1916 Ladies Home Journal Colgate's Talc Powder Magazine Advertisement. Any One Can Write a Talcogram. Ad features Cashmere Bouquet, Eclat and Colgate's Baby Talc. Ad is 7 1/2" high and 4 3/4" wide. Advertisement is in very good condition, suitable for framing. 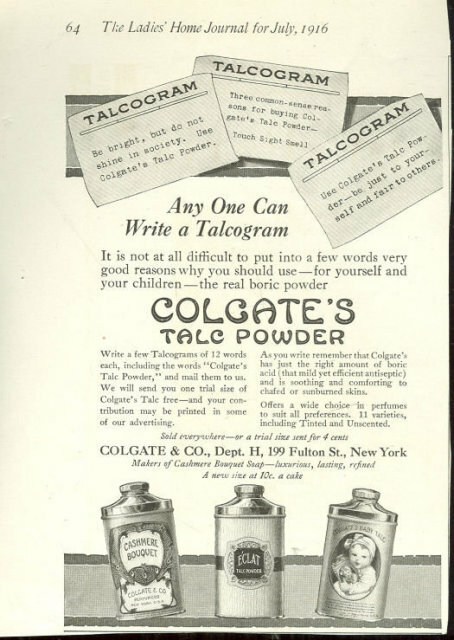 Items Similar To "Colgate's Talc Powder Talcogram 1916 Advertisement"